The seasonal curse has not stopped yet. The wet season causes months of suffering for many of our fellow citizens. Floods have inundated several places in West Java, Lampung and the Musi River delta in South Sumatra. Earlier this month, Kediri was also inundated with floods (The Jakarta Post, March 10). Landslides in Ciwidey and Cianjur add to the list of dark images of disasters in this country. Indonesia is besieged by two kinds of disasters: natural and man-made. Unpredictable earthquakes, for example, haunt its people. The movements of tectonic plates along the Ring of Fire which engulfs this country force us to be ready at anytime. On the other hand, the failure to take care of the environment results in endless catastrophes that could be avoided. Floods are real the evidence that ecosystems are strongly interconnected. What happens in one ecosystem could affect another ecosystem. Unfortunately, negative impacts are more dominant. Environmental damage on the upper part of the watershed area has created fear for lowland communities. Land conversions and forest logging are the main cause of many floods. However, unplanned regional settlements worsen the problem. Riverbanks are over-crowded by settlements and the water by rubbish. Sedimentation also reduces the capacity of river to flow. Floods have taught us that environmental mismanagement generates negative externalities. Lowland communities are affected by negative externalities of land conversions by people in the highlands. However, if we look at the issue in greater depth, land on the upper side of the watersheds is not only converted and utilized by highland communities, but also by people from everywhere, including companies and investors. Unfortunately, even though disasters keep happening, we are still under prepared. The increase in the intensity of disasters paradoxically makes those calamities routine. No wonder that disasters, especially floods that can actually be anticipated, will happen again and again. At the end, this will generate pessimism from communities as well as the government. The government, it seems, is incapable of solving the problem. But there is a lot that could be done. Legal frameworks for disaster preparedness and regional planning are on hand. Budget allocation for environmental rehabilitation is obtainable. Billions of rupiah, for example, have been spent on the Citarum River watershed rehabilitation project (Kompas, March 2). However, there seems to be structural pessimism. The government administration appears to be trapped in unproductive bureaucratic routines. Programs are more project-oriented, which then produce unwanted results. The government seems only to be running business as usual as there are no real golden plans to deal with seasonal disasters. The outcome then is the failure to anticipate as well as to handle those calamities. The state lacks the ability to deal with illegal forest occupations and is powerless when it comes to companies causing damage to the environment. Sadly, these negative community activities are sometimes utilized by the authorities to cover their incapability to manage the environment and to enforce the law. At the grassroots level, there are signs of communal pessimism. A lack of job opportunities has seen communities illegally occupy ecologically important areas and convert them into agricultural lands. The hardships of life force others to live along riverbanks. Consequently, when floods come, they seem to accept the conditions without complaining. This paradigm emerges from their inability to change the condition as well as a feeling of guilt that they have contributed to the damage. They do not consider that disasters such as floods are evidence of the failure of the authorities to manage environmental resources. When these two types of pessimisms meet each other, disasters will become a vicious circle. On the one hand, there will be an increase in man-made disasters and on the other hand we lack preparation to face natural disasters. When the people do not have anymore courage to question the government’s incapability to anticipate disasters, the state will never seriously take action. Unawareness and ill preparation will be commonplace. This will end in state negligence. Negligence is the main source of disaster. We may be better to look back at what happened last year in Situ Gintung. The collapse of the dam had already been predicted. However, there were no actions taken to avoid the tragedy. The combination of state failure (directly or indirectly) to manage the environment and the unawareness of people of environmental consequences is the best recipe for disaster. Are we going to let this happen again? 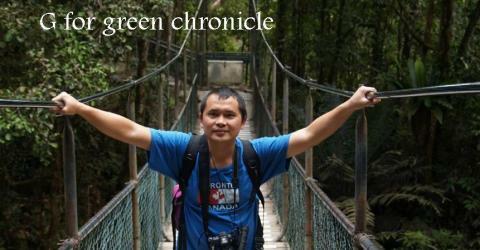 The writer is an ecologist at the University of Bengkulu and an Australian Leadership Awards fellow. « Is oil palm plantation forest? All articles in this blog are written by Yansen (University of Bengkulu) either in English or Indonesian. Most of the posts are documentation of my published opinions. The media which published the articles is acknowledged. Please feel free to leave comments either in Indonesian or English.